Repertoire includes: Poulenc’s Sonata, L. Boulanger’s Nocturne, Ravel’s Pièce en Forme de Habanera, Gieseking’s Sonatine, Martinu’s First Sonata, Hoover’s Kokopeli, and Muczynski’s Sonata. This recording pays tribute to the long standing friendship between the performers, to composers of the 20th Century, and to great chamber music. “Donald Sulzen and I have been friends for more than twenty years. We were both graduate music students at the University of North Texas until we completed our degrees and our careers led us in separate directions – his to Europe, mine throughout the United States. We have never performed together — until now. 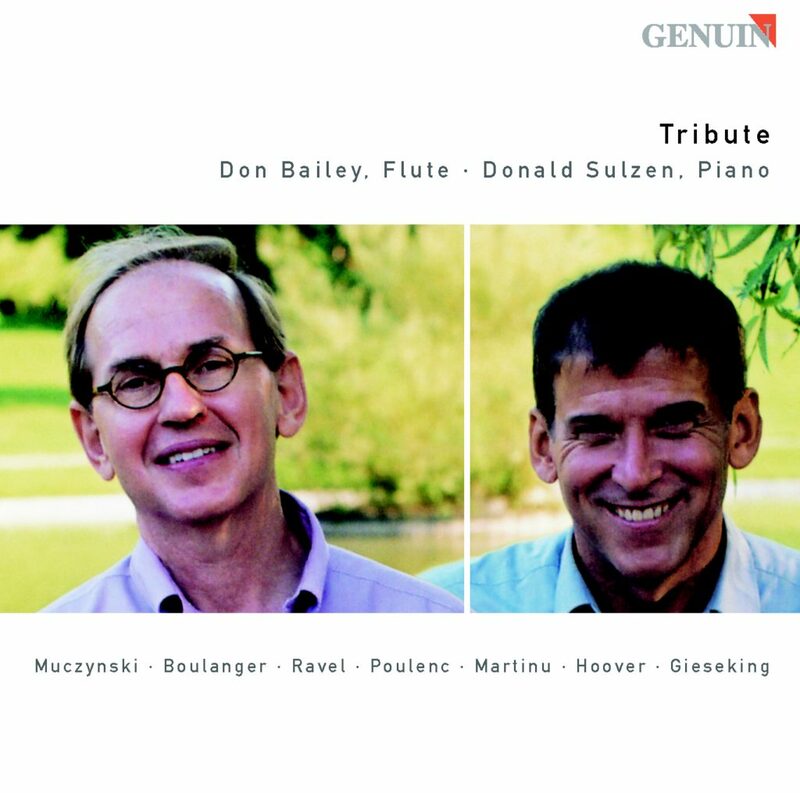 Before committing to the recording project, Donald and I asked ourselves whether the music world really needed another CD of flute works already on disc. What could we say that others had not, and how would we go about choosing the repertoire? After much discussion and careful consideration of our musical strengths and interests, we concluded that we could indeed add something of value to the ever growing collection of recorded music. We chose works composed during the 20th Century. Not only does each piece stand on its own merit, but we believe the collection as a whole displays a range of compositional style and dramatic diversity that makes for an interesting and enjoyable recording. …a delight from beginning to end…real musical substance…performances are impressive, enjoyable, and satisfying… Don Bailey boasts a brilliant technique and a bristling sense of excitement. Donald Sulzen is an adept and vigorous accompanist. The performance is excellent, highly charged, and exciting. The Poulenc Sonata is played brilliantly. The program is leavened by three works of lesser dimensions, each of which is performed beautifully. Don, I can’t remember if I wrote to you about your new CD, but it is great. I loved the repertoire too, especially the Gieseking. This must be a first recording. It did cross my mind how much study and preparation went into the making of this. Tribute captivates the listener with a gorgeously effervescent gift of musical gems, played with joy and heartfelt artistry. The CD is beautifully played from beginning to end. Kokopeli is just wonderful – you really have the totality of the piece, as well as the inner phrases, contrasts, etc. Excellent!!! Kokopeli stands out for the reason that we can easily hear your inflections, dynamics, and tone colors. Both of you are obviously terrific players, and the ensemble is tight. Congratulations all around! Wow! I just had to tell you what a GREAT CD “Tribute” is! Everything about it — choice of repertory, performances, sound quality, liner notes — is absolutely top-notch! You and Don make a terrific team. Nice blend of well-known with less well-known pieces. Listening to it transported me to another world — thoroughly entrancing and convincing, so imaginative, free and expressive! Also a bit bittersweet, for it reminds me that while Boise is a perfect place to raise my family, it affords me less opportunities to work with people of your caliber. I listened to KMFA yesterday and heard your CD! They played the Nocturne by Lili Boulanger and the Poulenc Sonata. It is terrific!! I was most impressed. The recording and more importantly the performances are wonderful. I will be going to your website to order a copy. “Tribute” is beautiful and interesting. …My favorite pieces are the Boulanger Nocturne which is played with the quiet yet lush romanticism it deserves, Ravel’s always gorgeous Piece en forme de Habanera, and Martinu’s First Sonata, which came through with great joy and energy. New York City is so lucky to have this great flutist/great person. We’re all lucky that these CDs are available to listen to, learn from, and enjoy.